My husband and I road-tripped to wine country to spend time with my mother-in-law for Christmas. Our stay was so nice, it always is. While we have quite some time before we retire, we do talk about living in that area someday. And not because it’s warm! But because it is so peaceful. From Sonoma we headed to South Lake Tahoe to stay in a lovely cabin we rented… but before we got on the road we stopped at the Glen Ellen Village Market to get some snacks. I couldn’t resist the opportunity to pick up a few bottles of local wine. Of the bottles we purchased I saved a few for when we returned home, one of which we enjoyed with our home prepared dinner on New Year’s Eve: 2008 Pellegrini Carignan – Redwood Valley. Wow this wine was fantastic! 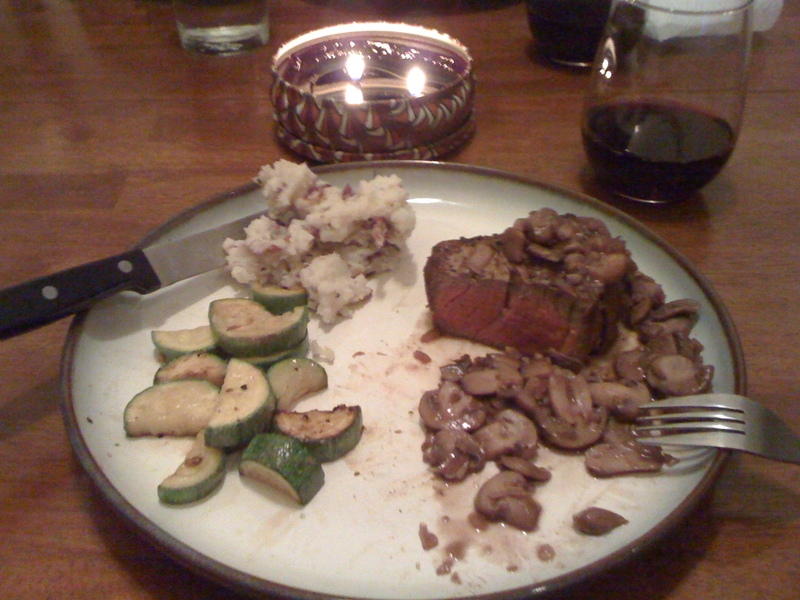 We paired it with excellent cuts of filet mignon and rib eye from Siesel’s Old Fashioned Meat & Deli located in Bay Park, San Diego, along with rosemary garlic potatoes and squash. This wine was amazing with our dinner! So good that I Googled Pellegrini Family Vineyard and bought two more bottles right from the vineyard! I made a statement to my husband on New Year’s Eve that it’s good to be older… We are only in our 30s, and God willing have a lot more time on earth with each other. But what I meant by that is we no longer feel the need get gussied up, go out, spend a bunch of money, only to be hung over the next day! Ah yes, aging isn’t so bad! Happy New Year to you and yours! I hope 2011 is one of the best years of your life! This entry was posted in Road Trips and tagged Carignan, Christmas, New Year's Eve, Pelegrini Family Vineyards, Sonoma, South Lake Tahoe. Bookmark the permalink.